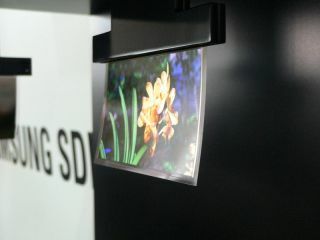 "It is technically possible to make the panel thinner"
Samsung has unveiled a super-thin, flexible OLED panel that can flap around in the breeze (should there be any) and simply be hung wherever you want it. Nikkei Electronics has reported from the Flat Panel Display (FPD) International in Japan that the new OLED type was named, with a great degree of originality by Samsung, as a 'flapping display'. The 4-inch panel has a sub-HD resolution of 480×272, although it also sports a 100,000:1 contrast ratio, easily better than most LCD TVs. "It is technically possible to make the panel thinner," a Samsung representative said, according to Nikkei, when giving the reason for not making the panel thinner than 0.05mm. "However, it is difficult to further reduce the thicknesses of the flexible substrates and circuit components around it." In order to make OLEDs flexible, obviously glass cannot be used, so Samsung manufactured this display in the same way as it would on glass, but then covered it in a very thin membrane. As this is a concept, there's no word on an official release or how long the display will last... but it's still super-cool and would let you watch TV while hanging out the washing.